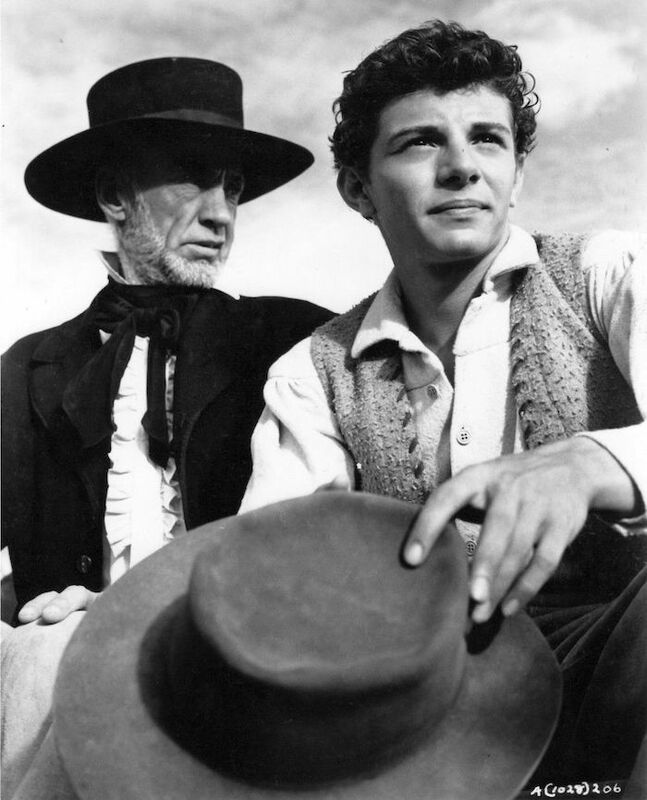 Hank Worden | 50 Westerns From The 50s. Screening: The Searchers (1956) In 35mm. John Ford’s The Searchers (1956) might be the finest film ever made, it’s almost certainly the greatest Western ever made, and it’s easily John Wayne’s best performance. Of course, I’m probably preaching to the choir. Here’s a rare change to see it on film, in a theater. Sorry for the short notice. 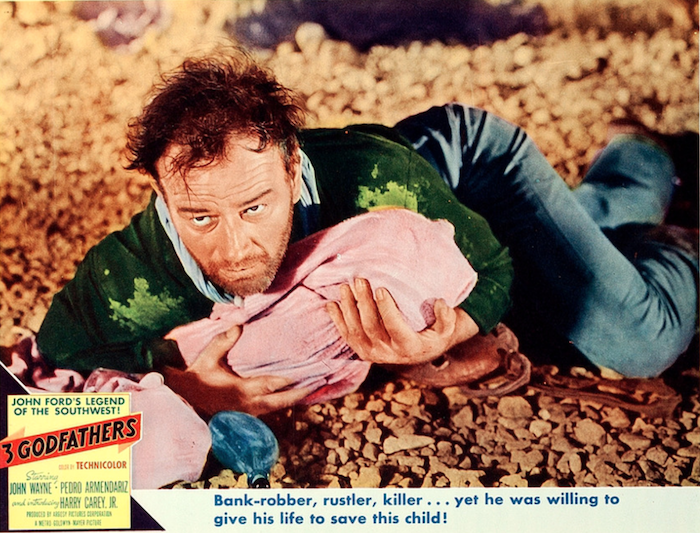 Click the lobby card for details. Character Actor Of The Day: Hank Worden. 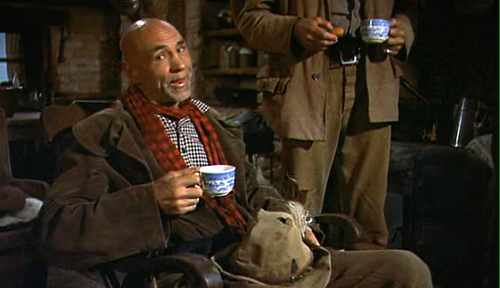 Been meaning to do a piece on Hank Worden for quite a while. He turned up in an episode of The Lone Ranger last night, so I figured now’s the time. His real name was Norton Earl Worden, and he was born in Rolfe, Iowa in 1901. He grew up on a ranch in Montana, attended both Stanford University and the University of Nevada, served in the Army, and worked on the rodeo circuit as a bronco rider. While rodeoing in Madison Square Garden, he and Tex Ritter were chosen to play cowhands in Green Grow The Lilacs on Broadway. That’s Hank in the yellow shirt to the right of Tex Ritter. 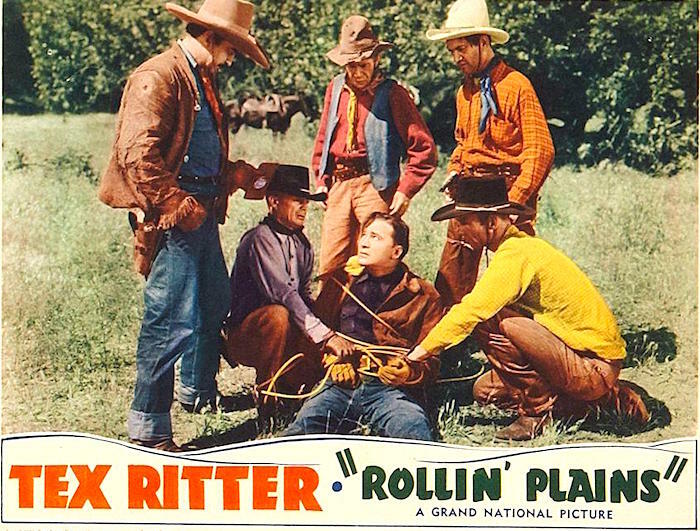 Worden broke into the movies with Cecil B. DeMille’s The Plainsman in 1936, and was soon appearing in Tex Ritter’s B Westerns. As a member of John Ford’s stock company, Worden’s in Stagecoach (1939), Fort Apache (1948), Three Godfathers (1948), Wagonmaster (1950), The Searchers (1956, up top) and more. Hank continued to work with John Wayne — as part of his stock company. Their last picture together was Cahill, US Marshall in 1973. He turns up in so much stuff: a couple of the Ma and Pa Kettle movies, Hellfire (1949), The Quiet Gun (1957), Dragoon Wells Massacre (1957), One-Eyed Jacks (1961‚ Marlon Brando killed him off way too early), Smokey And The Bandit (1977) and Clint Eastwood’s Bronco Billy (1980). On TV, he was on The Lone Ranger, Bonanza, Wagon Train, Petticoat Junction, even a few episodes of Twin Peaks (his last role). Hank Worden added something special to every movie he was in, but it’s Mose Harper in The Searchers that he’ll always be remembered for. And that’s not a bad thing at all. * One of my favorite photos ever posted on this blog. 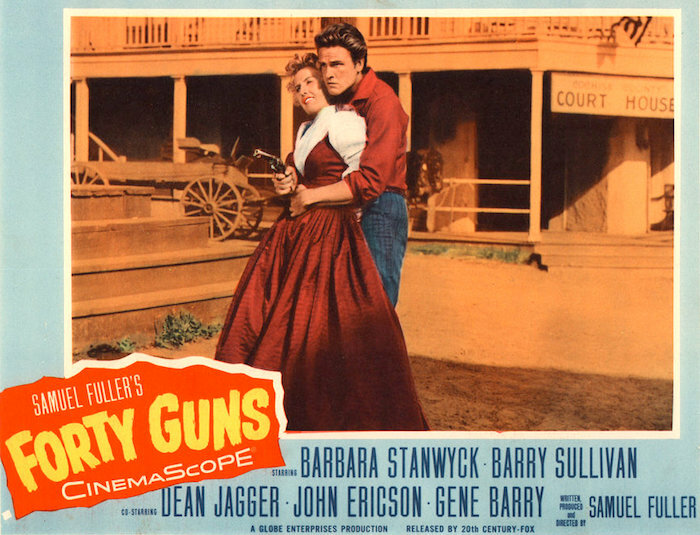 Blu-Ray Review: Forty Guns (1957). Film Editing: Gene Fowler Jr.
With a Sam Fuller movie, there’s always something kinda off. Not off in a bad way, off as in different from anything else you’ve ever seen — except another Sam Fuller movie. The performances, pacing, editing, dialogue — they’re just different. And that’s before you get to the story itself. A great example of this is Fuller’s Forty Guns (1957). It’s unlike any Western you’ve ever seen. 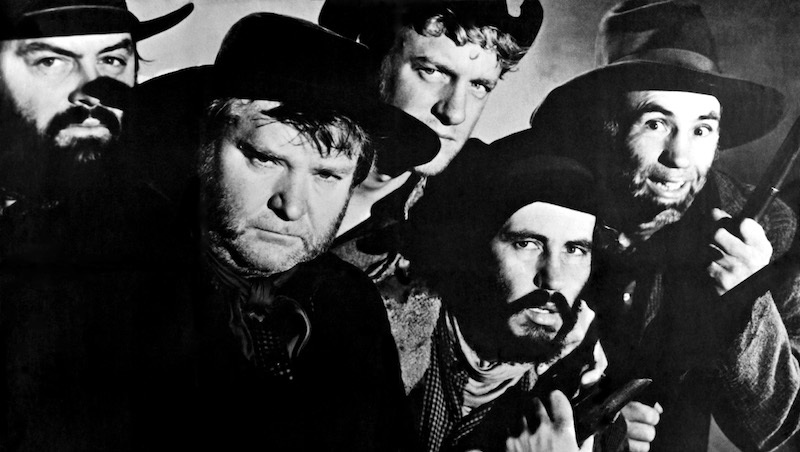 Forty Guns is a big sweeping epic on one hand and a glorified Regalscope picture on the other. There’s a scene pretty early in the movie where John Ericson and his gang of punks are busting up the town. They throw stuff, shoot stuff and just generally create total mayhem. Fuller cuts back and forth across the street as they shoot from one side and their bullets hit windows or whatever on the other side — then to the helpless, wigged-out townspeople watching all this. The footage doesn’t cut together in the smooth, traditional Hollywood way, but it perfectly creates the chaos and movement the scene needs. 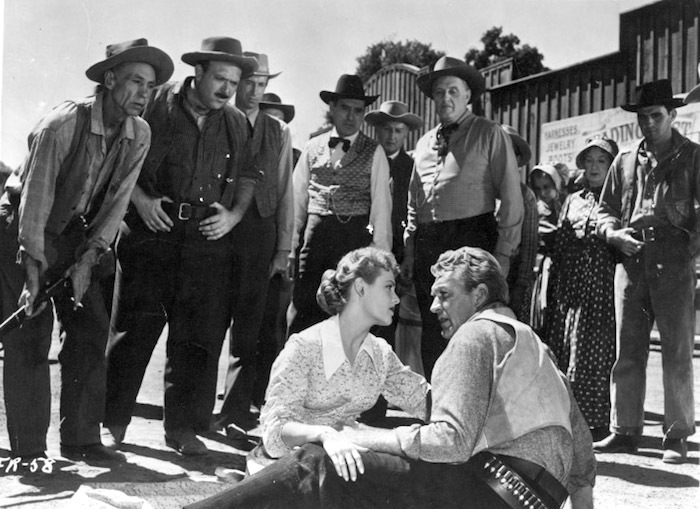 Barbara Stanwyck is terrific as Jessica Drummond, a female take on the rancher who runs the town. Barry Sullivan is Griff Bonnell, a former gunman now working for the government. So far, it sounds like one of your standard B Western plots — how many times was Roy Rogers a government agent? But that’s where the similarities end, as Forty Guns goes off in directions only Sam Fuller would even think of taking it. And he’s got a cast and crew eager to help him get there. It has one of the damnedest opening sequences I’ve ever seen, as the Drummond and her 40 guns come thundering along a deserted and pass by Sullivan and his brothers. I’d love to experience it on a big curved CinemaScope screen. 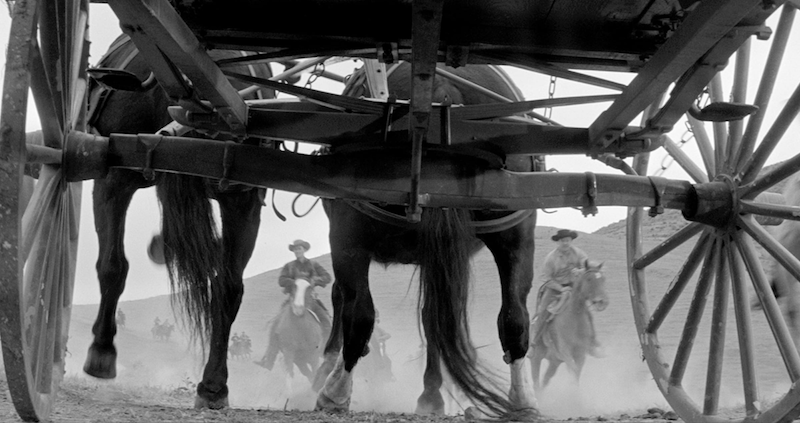 But from one end to the other, Forty Guns is a movie absolutely filled with striking images, cooked up by Fuller and delivered in gorgeous B&W CinemaScope by Joseph Biroc — and all flawlessly captured on Blu-Ray by Criterion. They’ve really got the contrast perfectly dialed-in on this one. Wish every black and white movie looked like this on video — everybody who helps bring old movies to TV and video needs to take a look at this. Of course, it’s got a typically Criterion-ish slew of extras — interviews, a documentary, even a chapter of Fuller’s autobiography. It’s a pretty deep dive, and it’s always a treat to wallow in Sam Fuller. He was a real character, a true original and one helluva filmmaker. Highly, highly recommended. 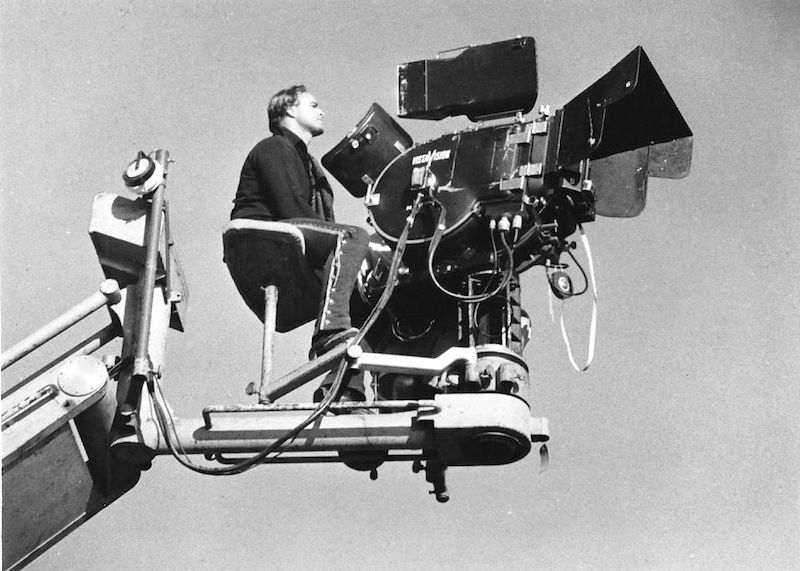 On December 2, 1958, under the watchful eye of DP Charles Lang, the big VistaVision cameras rolled for Marlon Brando’s One-Eyed Jacks (1961). It would be six full months — June 2, 1959, to be exact — before they stopped. A number of inserts and reshoots came later. My book on the film isn’t taking quite that long. Not quite, anyway. 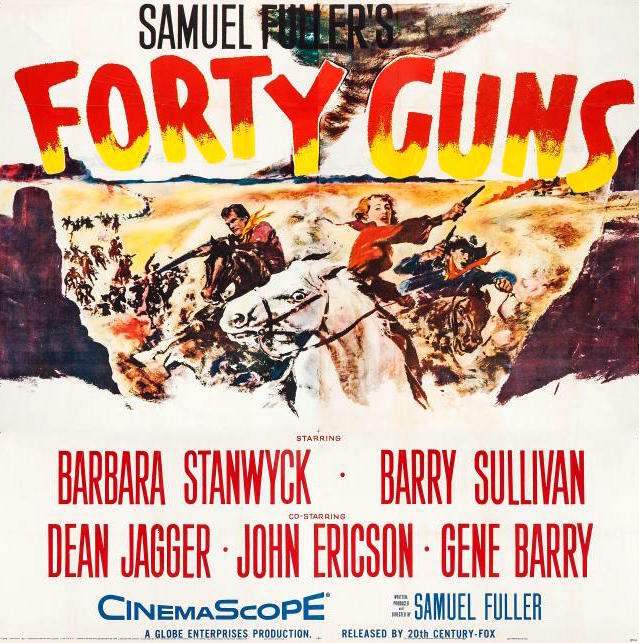 DVD/Blu-Ray News #266: Forty Guns (1957). Criterion has announced a December 11 date for their edition of Sam Fuller’s Forty Guns (1957). The extras sound terrific and I can’t wait to see its black and white Scope in high definition. This is one of those movies where you find something new to be dazzled by each time you see it. Absolutely essential. Music From The Westerns Of John Wayne And John Ford. 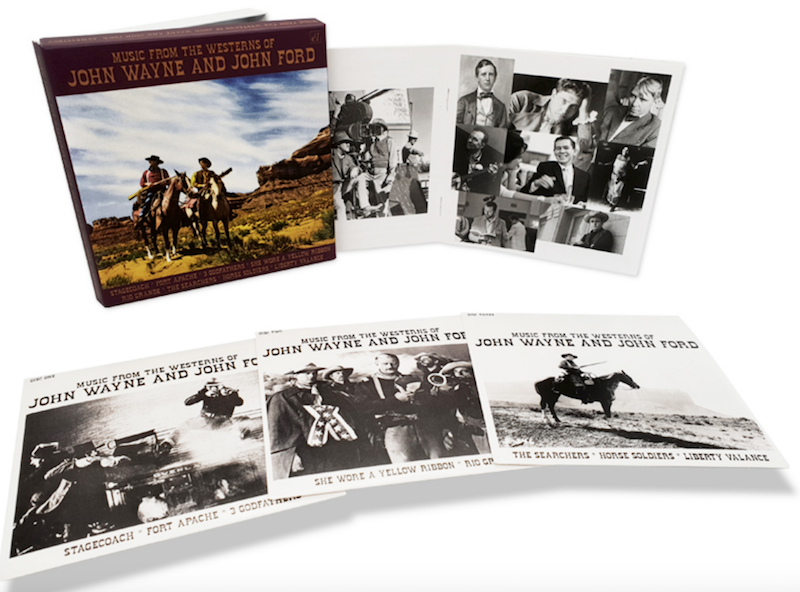 The music label Cherry Red out of the UK has released (or is about to release) a 3-CD set Music From The Westerns Of John Wayne And John Ford. Featuring music from Stagecoach (1939), Fort Apache (1948), Three Godfathers (1948), She Wore A Yellow Ribbon (1949), Rio Grande (1950), The Searchers (1956), Horse Soldiers (1959) and The Man Who Shot Liberty Valance (1962). 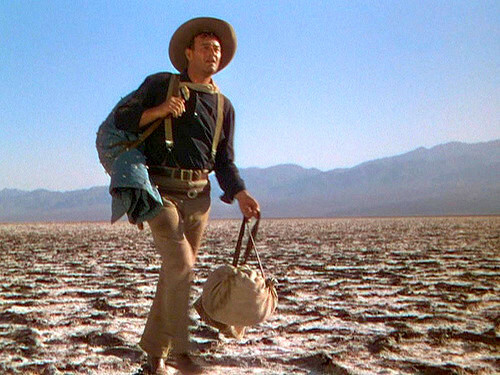 Of course, music is always a huge part of a John Ford picture, so there’s plenty of good stuff here. Sometimes it’s the original soundtrack (Rio Grande, Horse Soldiers), sometimes it’s from other sources. You can see a track listing here. This promises to be a very cool set. Can’t wait. Thanks to Mr. Richard Vincent for the tip. I tend to think of things in terms of movies. Several times a day, real life suggests something in some film I’ve seen at some point. Temperatures have been through the roof here in Raleigh the last few days. Walking across a parking lot today, I was reminded of John Wayne carrying little Robert William Pedro Hightower to safety in Three Godfathers (1948). Ford and Winton Hoch do a masterful job of conveying the oppressive heat and desolation of the desert. In a Christmas movie! Now, on to something else, because even thinking about Three Godfathers will choke me up!